The airline will offer 4 flights a week to Uganda from Dar Es Salaam International Airport (DSE), via Kilimanjaro International Airport (KIA), and will enhance investment, trade and tourism opportunities in the region, explained Eng. Ladislaus Matindi, Managing Director, and CEO of Air Tanzania. The Dar es Salaam-Entebbe air route is currently served by Precision Air, Kenya Airways, Rwandair, and Ethiopian. 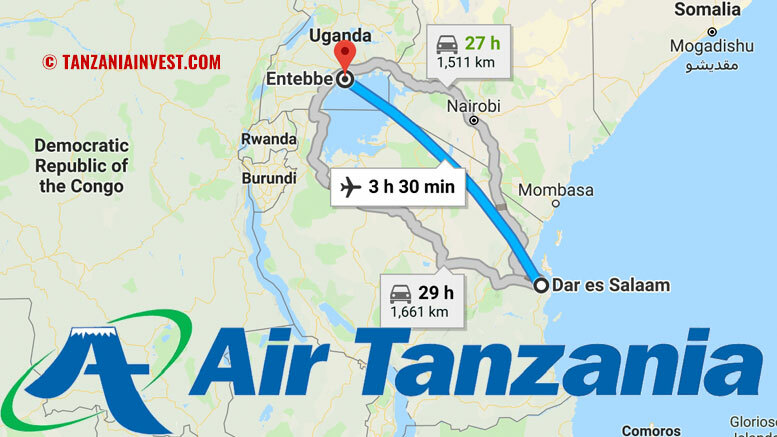 This becomes Air Tanzania’s third international flight after that to Moroni in the Comoros Islands, and Bujumbura in Burundi. By the end of 2018, the company plans to connect to Harare in Zimbabwe, Johannesburg in South-Africa, Mumbai in India, Bangkok in Thailand, and Guangzhou in China. Air Tanzania Company was established in 1977 after the dissolution of East African Airways. The airline was wholly owned by the Tanzanian Government until 2002 when it was partially privatized and the government reduced its shareholding to 51% and entered into a partnership with South African Airways. The partnership accumulated losses of more than Tsh 24 billion (USD19 million). The government repurchased the shares in 2006 and became again a wholly owned government company. In 2016 the Tanzanian government initiated a new drive to revive the national carrier, purchasing two brand new Bombardier Q400 which were delivered in September 2016. In December of the same year, the government further ordered four more aircraft, three from Bombardier and one from Boeing. In July 2018, Air Tanzania took delivery of its first brand new Boeing 787 Dreamliner, to be deployed on intercontinental flights.